Ever since I laid eyes on Carrie Sellman's (The Cake Blog) spectacular 12-layer Chocolate Chip Cookie Cake, I have wanted to make one of my own. Love her blog, by the way! 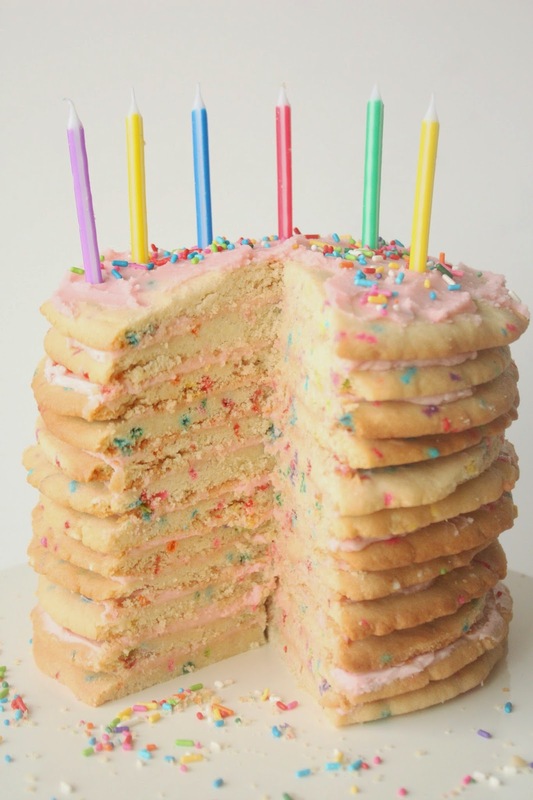 Well, March 30 was the 6th birthday of my blog, and I thought it was the perfect occasion for a 12-layer cookie cake! 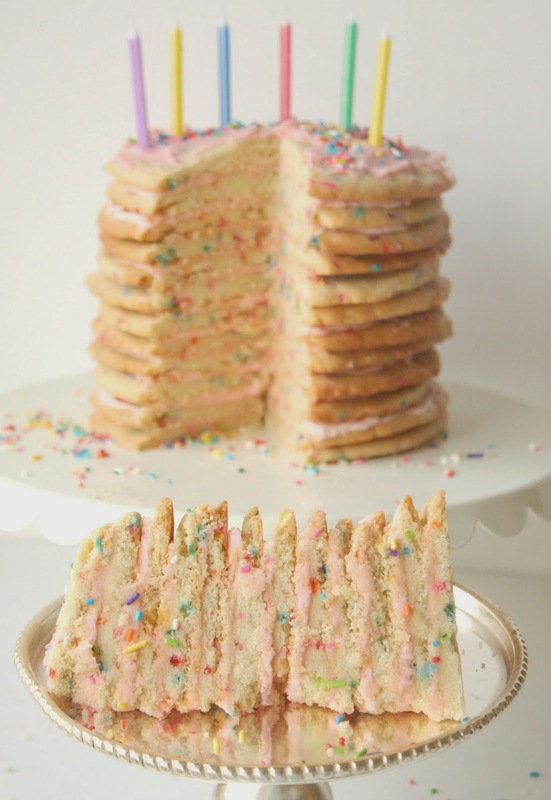 To celebrate Munchkin Munchies being around for six years, I figured a sprinkle laden, sugar cookie cake would be perfect! Top left: I used a #10 scoop for the cookie dough (looks like ice cream:)). and placed it on parchment. Top right: Place parchment (not in photo) on top of the dough ball, and firmly press down (with your hands) and then outward rotating it around to make a circle. You can re-use the top piece of parchment on the other cookies. Bottom right: Pale pink frosting for the filling. Tip: I rotated between four cookie sheets so that two had time to cool (while the other two baked) before I needed to use them again. 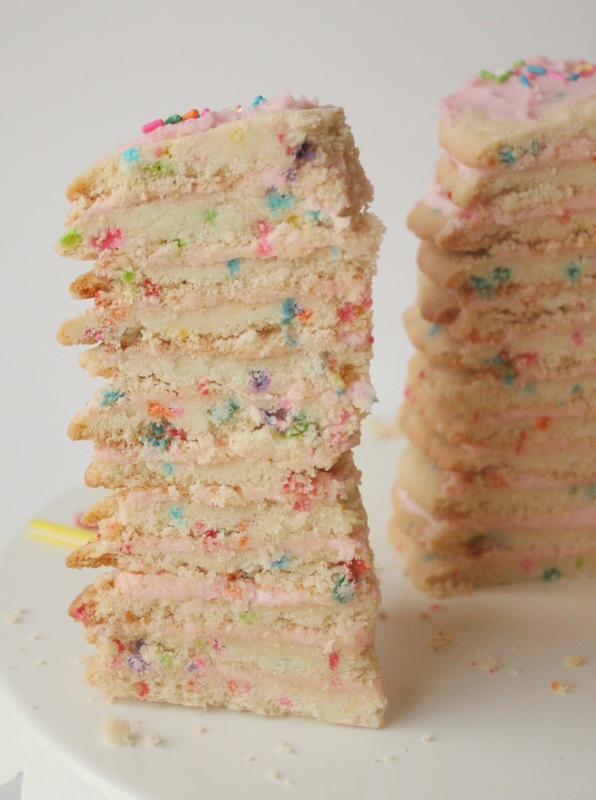 I love the look of this sprinkled, sugar cookie structure and the pink icing between the layers. The next morning when I sliced into it, my expectations were definitely met! 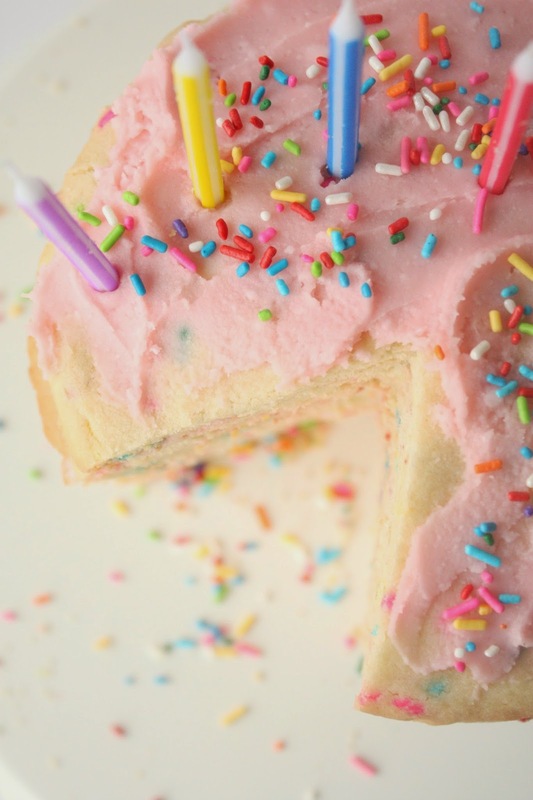 I couldn't resist adding the last bit of saved frosting* to the top of the cookie cake (which also covered the crack:)) and sprinkles...it's not everyday that your blog turns six! *It was pure serendipity that when I was making this cookie cake, I discovered Sweetapolita's book in my mailbox. :) I used her Vanilla Bakery Frosting recipe and it was perfectly delicious! I know Rosie's book is destined to become one of my favorites! I shared this wedge with my husband and we both loved it! The cookies were soft, with crunchy edges, and the creamy, tasty frosting complemented the cookies perfectly. Quite a bit of "WOW" factor! Happy 6th birthday to Munchkin Munchies! 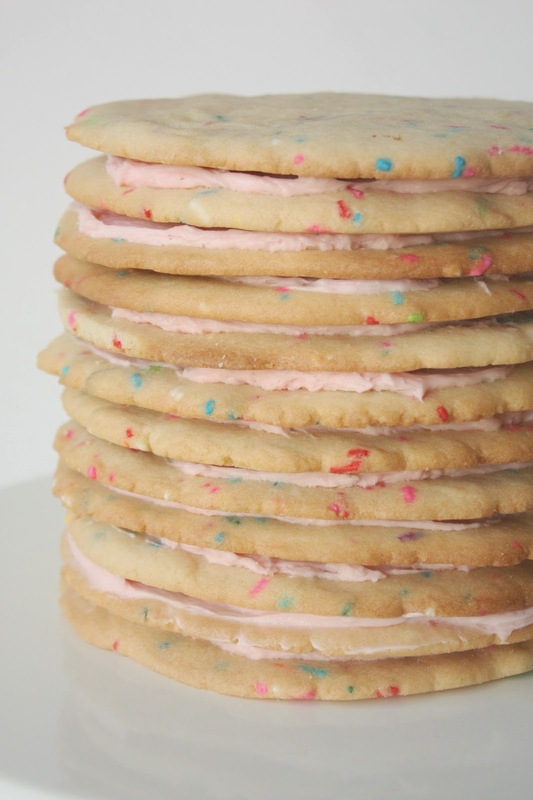 I look forward to trying this with other cookie/frosting combinations, though I think this one will be hard to beat! Thanks Carrie for the fabulous and fun idea! 1. 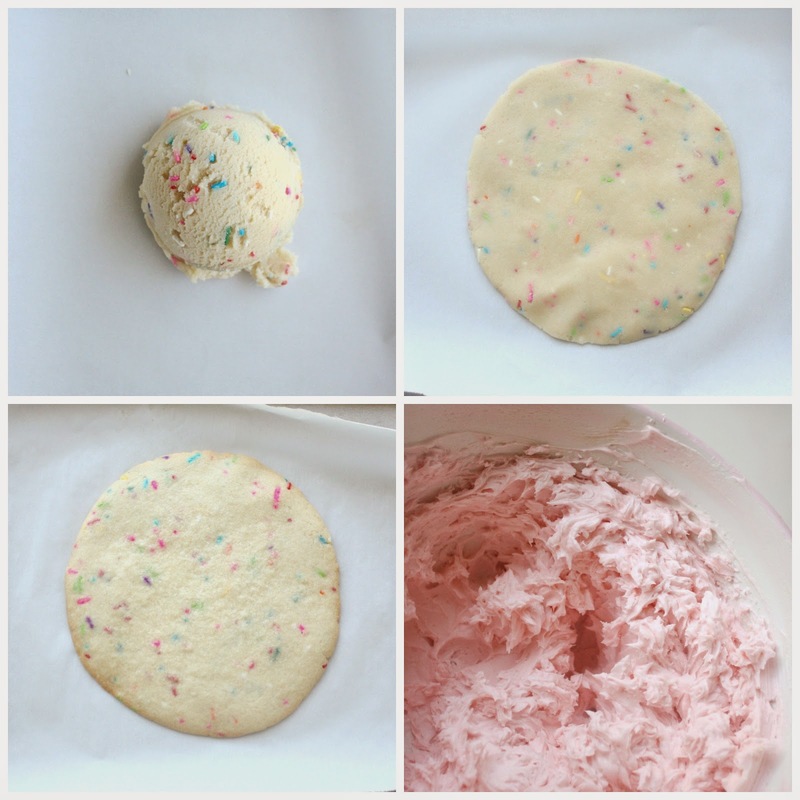 Mix up sugar cookie dough (This recipe made a dozen cookies). Don't forget to add sprinkles! 2. Place a mound of cookie dough (I used a #10 scoop, 3-4 oz.) on a parchment lined cookie sheet. 3. Place another sheet of parchment on top of the cookie dough and use your hands to shape the dough into a circle about 1/4-inch thick. 4. Remove the top sheet of parchment (use it with all the cookies) and bake the sugar cookies at 350 degrees for about 13 minutes, or until browning around the edges. 5. Lift the parchment sheet with the baked cookie from the cookie sheet and move it to a cooling rack. Let cookie cool. Remove the cookie from the parchment and let it cool completely. 7. 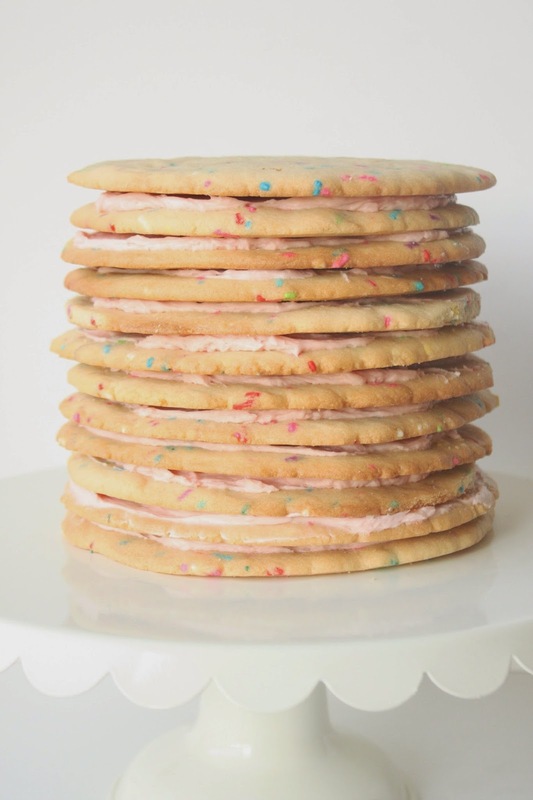 I held each cookie in my hand while I used a small, offset spatula to spread a thin layer (tinted pink!) of the soft, creamy frosting around it, coming about a 1/2-inch from the edge. You may place the first cookie directly on the serving platter and frost it that way if you prefer. 8. When all of the cookies are frosted and stacked, the cake needs to rest, covered, for at least 4 hours, or overnight. 9. Time for the payoff...slice it up (I used a serrated bread knife) and serve some happiness! 1. In the bowl of an electric mixer fitted with the paddle attachment, beat the butter, shortening, and salt on medium speed until very pale and creamy, 8 minutes. Gradually add the confectioners' sugar, heavy cream, vanilla, and almond extract. 2. Reduce the speed to the lowest setting and beat for 1 minute. Increase the speed to medium-high and beat until very light and fluffy, about 6 minutes. 3. The frosting will keep in an airtight container in the refrigerator for up to 3 days. Bring chilled frosting to room temperature and beat on low speed to soften. If necessary, you can warm the frosting in a heatproof container in the microwave in 10-second intervals, stirring after each one, until smooth and spreadable. and you smell like one too :)! Lisa, Your comments are the "icing on the (cookie) cake"! Thanks for your sweetness! Happy Blog Anniversary, Sue! The cookie cake looks splendid! Thank you, Angie! I always appreciate you taking the time to comment! 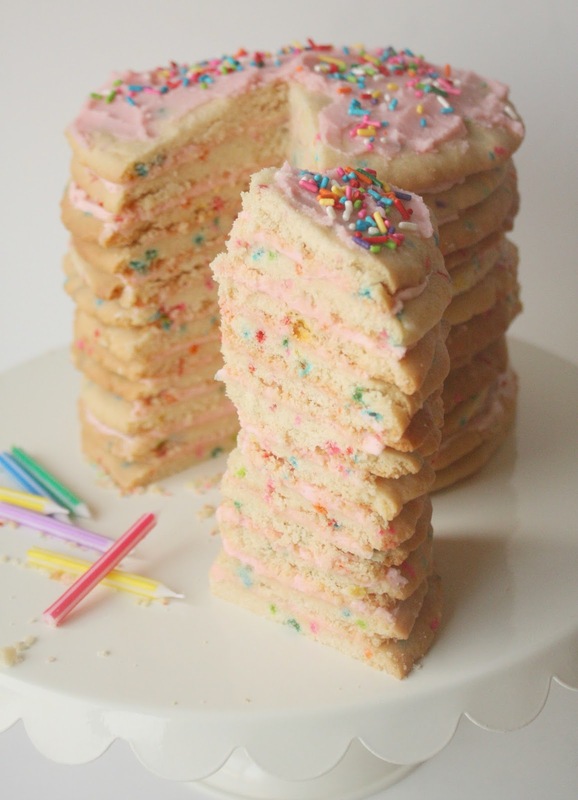 What a wonderful way to celebrate your 6th birthday - with a sugar cookie cake! Looks delicious, wish I could have a slice! :) Congrats on 6 years! This is AH-mazing! But then, I'd expect no less from you. 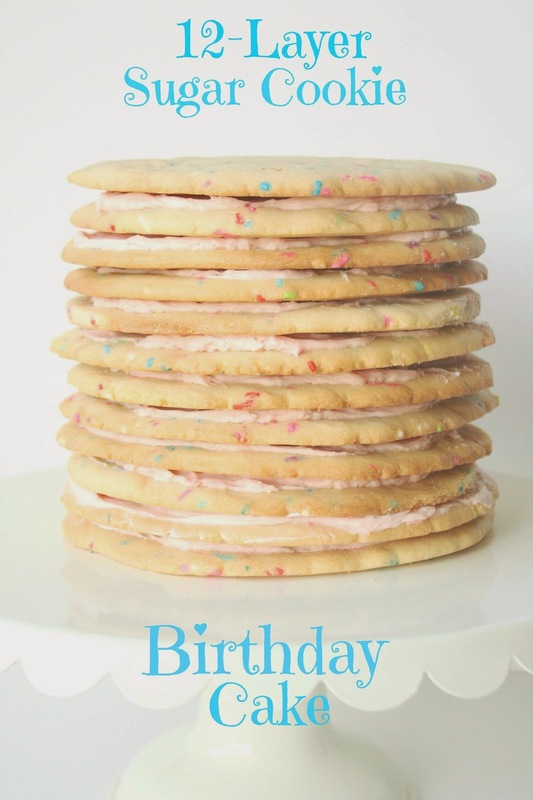 Happy blog birthday, sweet friend! Thanks for the kind words, and blog birthday wishes, sweet Heather! XOXO! Six years! That is awesome! I can't imagine a better cake to celebrate six years of awesomeness. Happy Birthday and thank you for all the beautiful gifts you have made for us through the years. Thanks for taking the time to comment, Lisa, and thank YOU for tons of cookie inspiration! Congratulations on 6 wonderful, creative years! Such a fun way to celebrate. Yay! Congrats on 6 years!! :) I'm so in love with this cookie cake!! So fun and pretty, and (I'm sure!) delicious!! Congrats, Sue! You have taught me a lot about cookie photography with your blog (and that wasn't your intention even, right!? ), and our mutual love of cuteness and sprinkles makes me following along all the more sweeter. Happy birthday, Munchkin Munchies! Thank you, Karen, for your support and kindness! this share leaves me speechless and happy. Thanks for your support over the years, Linda! I love your blog! Beautiful cake to celebrate six years! I am turning five next month! 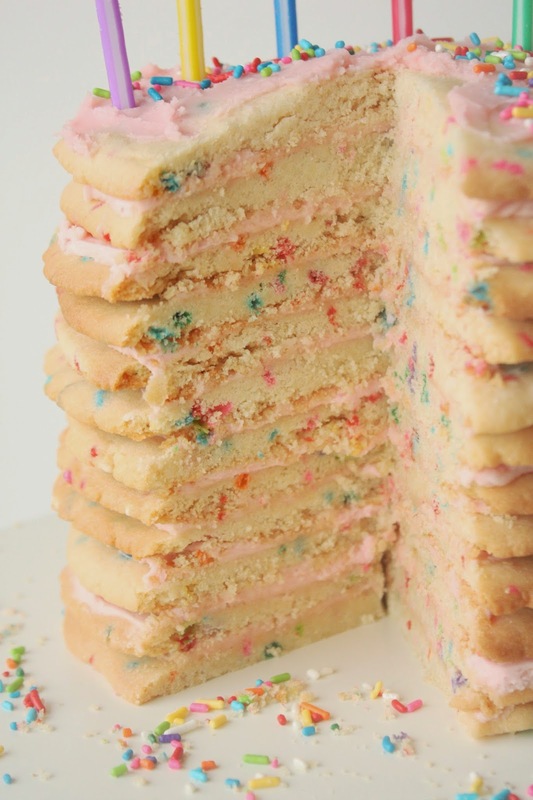 Wish I had a bite of this, but as much as I like sugar cookies with frosting, I would probably eat the whole thing myself. Thanks for visiting, Lyndsay, and for your kind comment! I've been wanting to make a cake like this for years! Loved the original inspiration, and love how colorful yours is, too! Thanks for sharing your experience. Someday my kids will let me make them one for their birthday!